The Kankakee Police Department has an authorized strength of 74. Currently the department stands at a strength of 70 sworn officers. Of those, 43 operate in the patrol division; 12 in investigations; 8 in KMEG (Kankakee Area Metropolitan Enforcement Group), 2 in juvenile; and one in stolen auto. In addition, the Kankakee Police employ ten civilian employees. These jobs include records, technology and community service. The department’s annual budget in 2012 was $8,929,704. After receiving a charter from the Illinois General Assembly, the first election was held in Kankakee City on Tuesday, April 10, 1855. George Kerns was elected to the office of Constable and Collector becoming the first Kankakee City law enforcement officer. In 1865, under a special charter, the mayor-council form of government. The City Marshall was one of the City Officers elected each year in the City Election. The Mayor appointed the members of the police department. The first record of a City Marshall was found in 1867, when John Raap was elected. The last City Marshall, James P. Russell, was elected in 1891. In 1892 , the city reorganized under the state's general law governing municipalities. Under this law the Chief of Police is appointed by the mayor, with the approval of the city Council. On Thursday April 28, 1892, Ben W. Rives was appointed Chief of Police by Mayor P.J. Kelly. For several years, the Chief of Police was also referred to as the City Marshall. In the years between 1892 to present day, there have been 23 Chiefs of Police and two acting Chiefs. The only Chief to retire on pension was Wallace L. Flannery who retired in 1961 after 22 years of service. The Chief to serve the longest in that position was Dean R. Bauer, who was chief from 1970 to 1985 (fourteen years and five months). The police officer to serve the most years on the department is Lieutenant Richard Wischnowski, who served from 1947 to 1982. Lt. Wischnowski served for 35 years and six months. 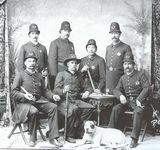 The Police Department has always been staffed by Sergeants, dating back to 1895. At that time there were two twelve hour shifts. The 1st Sergeant was in charge of the first shift (from 6:00am to 6:00PM). The second sergeant was in charge from 6:00pm to 6:00am) The two shifts continued until the late 1940's before three eight hour shifts were established. On May 22nd 1900, a City Ordinance was passed creating the position of a man in citizen's clothes (City Detective). The first City Detective was W.E. Snyder on 5-23-1900, the last City Detective, under the ordinance, was Wallace L. Flannery on 10-03-45. On 10-1-45, a City Ordinance was passed creating the ranks of Captain and Lieutenant and, eliminating the City Detective. The first Captain was Wallace L. Flannery, who was elevated from the position of City Detective on 10-3-45. The last Captain was Virgil E. Jordan on 2-7-72. This position was only held by four officers. On 2-7-72, a city ordinance was passed creating the position of Assistant Chief. The first Assistant Chief was Virgil E. Jordan appointed on 2-7-72. The last Assistant Chief was John E. Gerard 5-8-85. These were the only two officers who held this rank. On 5-1-1921, Sergeant John Fairbairn became the first police officer to retire on pension after twenty years of service. On 10-19-1925 Desk Sergeant Joshua Watson became the second officer to retire after 20 years. Prior to the establishment of the Civil Service Commission, or the Police and Fire Commission as it is known today, all appointments to the Police and Fire departments were made by the Mayor. When the Mayor changed so did the Police and Fire Departments. In 1923, Democrat Benjamin W. Alpiner was elected Mayor, running on the People's Party Ticket. Upon being elected Mayor, Alpiner fired the entire Police and Fire Departments. On Tuesday September 4, 1928 a special election was held. The citizens of Kankakee voted in civil service, for Policeman and Fireman, by 430 votes. Following the election Mayor Louis E. Beckman appointed Fred Geisking, Fred Roach and Harry Topping to the Civil Service Commission. The first meeting of the Civil Service Commission was held on Monday October 8, 1928. Fred Geisking was elected chairman and City Clerk Harry C. Thompson was elected Secretary.